Here are 8 great "end of the world" movies from Netflix to stream instantly. The original movie, War of the Worlds, was a classic in itself. That movie included the providence of God intervening on behalf of humanity and by the smallest of things; bacterial, invisible to the naked eye, but for most of us, we’ve built up resistance to a lot of these. Plus, we have better hygiene today than even fifty years ago. Even though the first War of the Worlds was good, the 2005 version may even be better, at least as far as end of the world scenarios are concerned. Director Stephen Spielberg does his usually brilliant directing and the casting is perfect, with Tom Cruise, Dakota Fanning, and Tim Robbins. In this movie the earth has been invaded by a far superior alien force that is set on conquering the earth. Their deadly tripod fighting machines are no match for hand-to-hand combat, but one family takes a stand and it leaves you on the edge of your seat to see how it will end. The science fiction movie, Halo, is about an intergalactic military conflict between alien forces known as the Covenant. The Covenant’s leaders are prophets who are also their religious leaders and will do anything they say. Their religion is worshiping the Forerunners, an ancient civilization that became extinct due to their encountering the “Flood,” which was a tiny parasitic alien life form that was allied with the other alien forces (known as the Covenant). Seeking a Friend for the End of the World is a 2012 release that is about the end of the world but only that it’s comedy and drama. Both halves of this comedy-drama are great. Steve Carell and Keira Knightley fit together perfectly. The movie is not based upon a book or a scriptwriter, but a sound track from Chris Cornell’s 1999 album, Euphoria Morning. The track that the movie’s named after is “Preaching the End of the World.” It’s based upon something very similar to the album track because there’s a news reporter whose job it is to tell the public that they’re all about to die in about three weeks from an asteroid! Talk about no job security! The Matrix (2000) is all about artificial intelligence and after mankind nearly destroys itself, the computers (AI) takes over and somehow has all of the humans living in a dream world. They think their working, eating, driving, marrying, and so on, but in actuality, the Matrix has deceived them and even uses humans to generate electricity for their power and the Matrix itself to operate. Their agents are a deadly force out to find those who know too much, like Neo, a computer hacker who comes to realize that the world is only an illusion that he’d been living in a dream world and now, Neo fights with the Rebels against the Matrix itself, but the sobering truth is; every human who’s ever fought with an agent has died. Hidden, released in 2015, is about some unknown virus that rapidly spreads and becomes deadly for everyone it comes in contact with. Apparently, most of the world is wiped out but at least one family survives (that we know of), which includes the father, Ray (Alexander Skarsgård), Claire (Andrea Riseborough), and their young daughter, Zoe (Emily Alyn Lind). They are to remain there for as long as they can hold out but when their storage of food begins to dwindle, and they find a rat’s been eating their food, the reason that they might have been exposed. Dad tries to reassure everyone but the long wait is almost too much for the young girl. There are still “breathers” out there and they’re a threat. They are the only lifeform that’s alive now but you couldn’t really call them human. The movie, I Am Legend (2007), stars Will Smith who plays Robert Neville, a U.S. Army virologist, and his purpose is to create an antivirus to a virus, originally created to cure cancer, now turned against humanity itself. By the time Neville gets to the lab and finally produces a cure, he is surrounded by mutants everywhere who are all about to close in and kill him and the cure with it. He has to survive somehow to get the antidote back to a small village of humans who are protected there, so he gives it to Anna (Alice Braga) for her to return it, puts her out of harm’s way, and destroys most of the Darkseekers who were about to break down the Plexiglas partition, separating him from death. He decides to give his own life and take out the other Darkseekers so that Anna can return the antidote herself (along with her son, who was also immune, named Ethan (Charlie Tahan). 28 Days Later (2002) is a British film about the post-civilization, or at least what’s left of it, after an accidental release of a deadly virus and the death spread so rapidly because it was highly contagious. This put mankind back on its heels which didn’t allow them to respond in time for an antidote. After only a month, the virus has taken so many lives that only a few survivors remain and these try to take sanctuary somewhere so that might not contract it. But then, they run into those who should be helping them, like the military servicemen, but in turn, took advantage of them. The original or premier movie has some similarities with the later version, Planet of the Apes (2008), staring Mark Wahlberg, and it had one of the best endings of what he used to know as “his world.” He returns in front of what he thought was the Lincoln Memorial, but instead is a monument to the same wicked ruler he had tried to escape. This was one of the best endings you’ll find in these “end of the world” movies. In the original movie (1968), Charles Hesston finds that the planet he was on and believed to be an alien planet was the very planet he came from. By the time he returned, through a sort of time warp, he had gone far ahead in time, where the apes had advanced enough to rule civilization, he at the end of the movie, Neville (Hesston) discovers he’s came back to his own planet and it’s a civilization where humans must submit to the apes. The Apes are harsh and treat the humans cruelly, almost like a social statement about the way we sometimes treat animals. 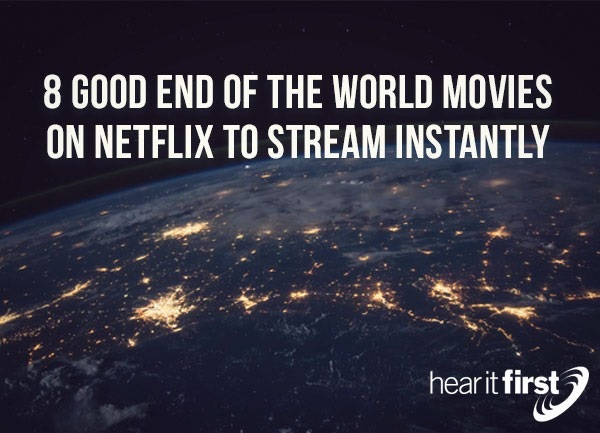 Of course there are hundreds of other “end of the world” movies from Netflix that you can stream instantly. Many that you suggest are probably better than these that I’ve listed, so by all means, let us know which “end of the world” movies you enjoy and why so that we might look at other options, particularly when you want to have a family movie night.